This was our usual eclectic group of canvases to challenge Brenda with. 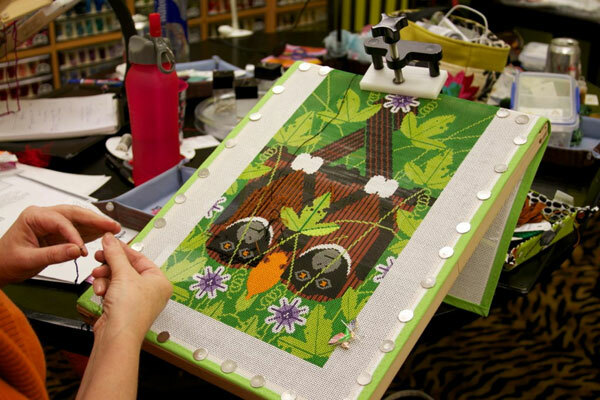 Charley Harper’s Love on a Limb is going to be gorgeous when Pat finishes it and that’s going to be double quick thanks to the stitches Brenda chose! Can you see the twinkle in Andrea’s eye. She’s excited because her entire canvas is planned!!! She’s an organized girl and got all the details worked out quickly in the 3 days she was here. 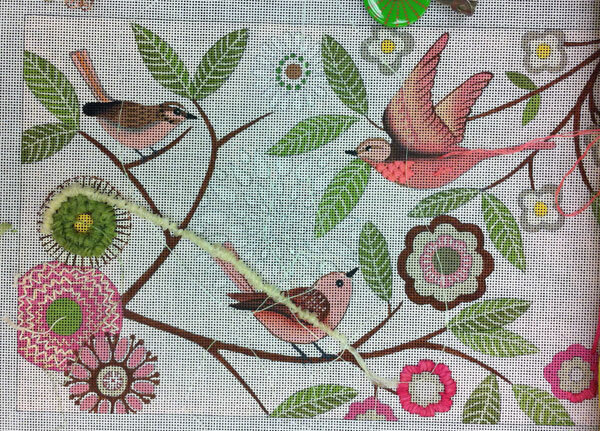 So quickly in fact that she treated herself to a new canvas and had Brenda stitchguide the flowes and birds on this one too! 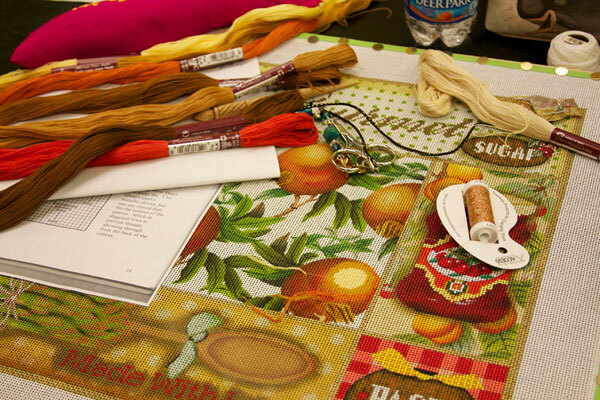 If you know Palma, you know she is a quick stitcher. 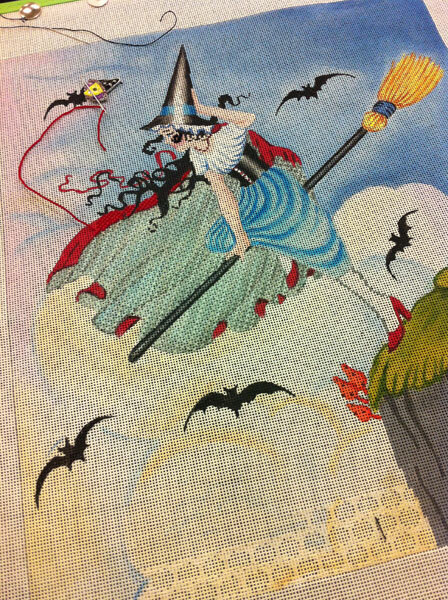 She worked on this great witch by Brenda Stofft. Check out the cape. Love it!!!! 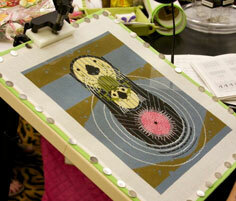 Wendy is working on a new Charley Harper, Devotion to the Ocean. The urchin will be beaded and the crab will be crystalized with Swarovski! 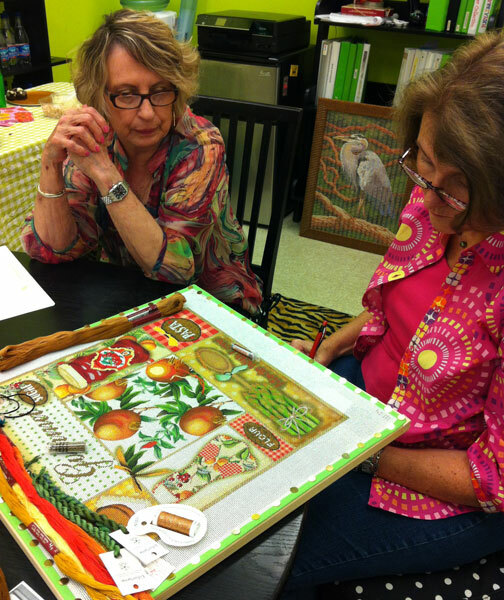 Kathy and Brenda are planning this Lani canvas. Each little area is it’s own masterpiece. Gourmet is all beaded. 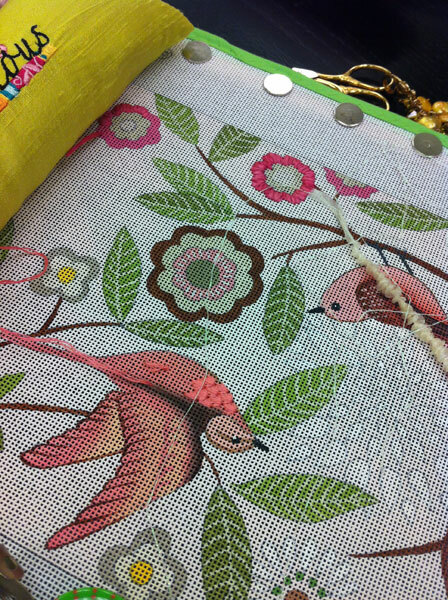 There’s metallics and silks and beautiful stitches selected! 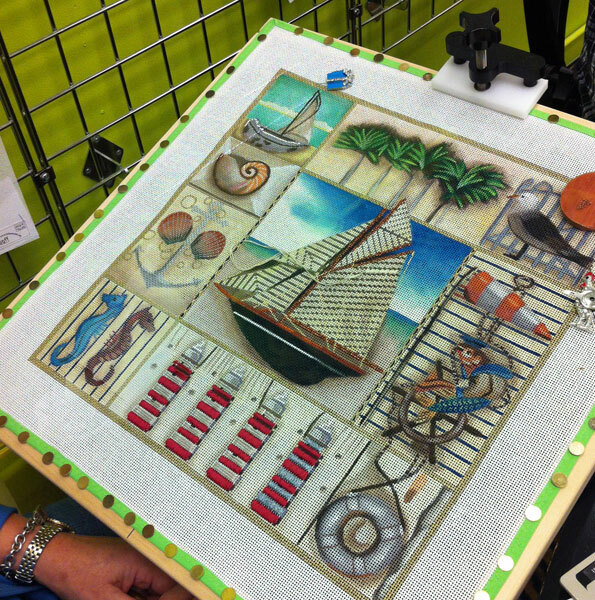 Barbara is working on another Lani canvas with great areas. I love the borders! 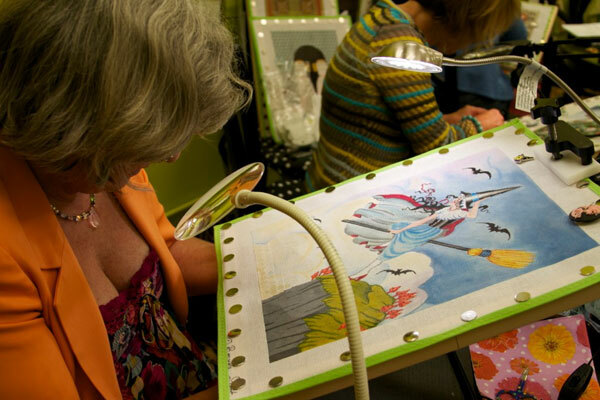 Check out what Sue is doing on this Hal Mayforth canvas. 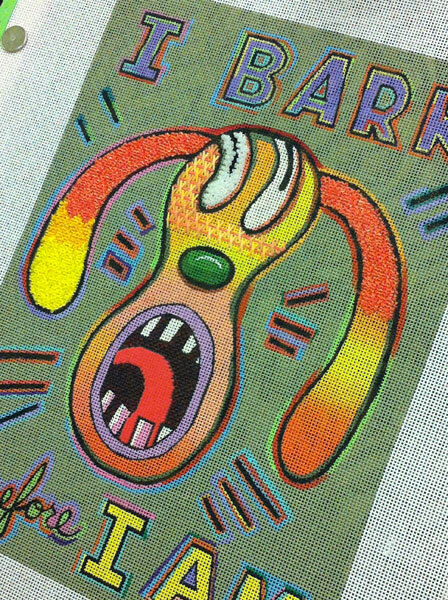 It’s going quickly and so much fun and so much color. You know we love that! 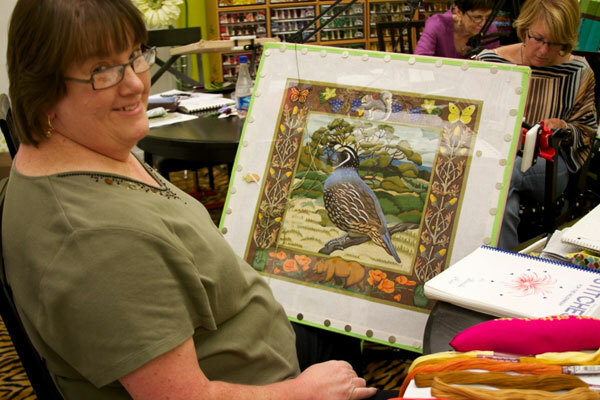 Sheena was working on another Lani canvas when she wasn’t putting the finishing touches on the Needlepoint Fairy from my line. Stitchguide and more pictures will be ready very soon!!!! Stop back and visit again soon. What fun everybody is having and the canvases are stunning! !